If I could remove the heat and humidity, I would give serious consideration to moving to the South. The charm, the manners, and the accents, especially, have intrigued and romanced me for years. And now I’ve found the Liz Talbot mysteries to further entice me. A young socialite has gone missing and the family has hired Private Investigator Liz Talbot to locate her. Liz and her partner dig in to the investigation, turning up evidence and leads that the local police hadn’t. But it seems as though the more Liz finds, the more she herself is in danger. Susan M. Boyer is a talented writer who graciously invites her readers into the heart of Stella Maris, South Carolina. I could practically hear the southern drawl in my mind’s ear as I read! I read much of the book on vacation – it turned out to be the perfect read. As this story unfolds, it becomes harder and harder to put down. The plot seems to thicken and get more and more entangled the closer Liz gets to the culprit. Then, suddenly, the classic mystery revelation pulls the right string and everything falls in line with astonishing clarity. 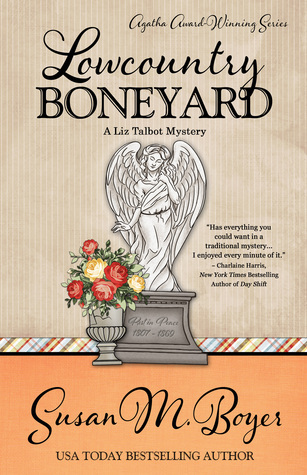 Lowcountry Boneyard is the third Liz Talbot mystery and I’m hooked on the series. Lowcountry Boil starts the series and is followed by Lowcountry Bombshell; two books that are most certainly on my to-read list before the next adventure comes out. Thank you so much for reading and for this lovely review! I deeply appreciate your kind words, and I’m thrilled that you enjoyed the read–especially on vacation!